As an EMPAC Fellow I got an introduction to research. Believe me I started from no previous experience! I worked through the basic of different approaches and saw the benefit of getting at the best information in any one circumstance to inform the best decision making. I see the real benefit of this to policing and I encourage all my colleagues out there to give it a go too! I became aware of the various ways of publicising research (called dissemination – from the Latin meaning to ‘scatter seeds’ – impressed eh?) and these can include academic journals. I chose to use a blog because I was most motivated by getting as many people as possible to be able to read about my work – and if you’re reading this, that shows it’s working! My research started with a thought (this can be called a ‘hypothesis’ that you test out) that the NDM could be used more, right across the blue light services and other partners, such as social care and health. The point was to see if there was a way of improving communication and transparent decision making towards common goals that partners could use and would work as well at 2pm on a Tuesday afternoon as 2am on a Saturday morning. I was very interested in applying what I found, although I appreciate the importance of working through a systematic approach in the research cycle. Funnily enough I found a lot of parallels with the research cycle and the NDM. The research cycle is basically to identify a research question, consider ethics (so no-one gets harmed in the process), consider what is already known (this is known as a ‘literature review’), the method and methodology (which is like ‘options’ under NDM – how you could go about things); analysis and conclusions. The mind boggling thing I found about considering research was how it challenged everything – it was about asking questions on topics you thought you had all figured out or just assumed about. This approach of questioning things – called ‘critical thinking’ – though isn’t that far apart from how you use the NDM as well in deciding on a strategy, objectives and justifying your actions. In this way, getting a insight into research wasn’t a one-off experience, it’s a form of mind-set that you take with you; to question things, to be curious, to look into things more. It makes you less complacent – you get more aware of the limitations of what you know and how you need to be asking and listening more. All that when applied to policing means you can get better operationally. So far from this being a useless skill, it’s pretty vital given the complexity of modern policing. I started my research firmly rooted in an interest in decision making, and particularly how the NDM is used, and maybe not used as such as it might. The NDM is a risk assessment and decision making process. It was created by the Association of Chief Police Officers (ACPO) as a replacement / update for the Conflict Management Model. This new model could be used across the board for any type of decision. 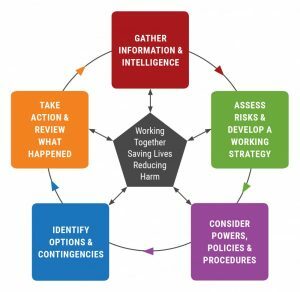 The NDM (left, and the Joint Decision Making Model – JESIP, below) are not just for the decisions but also for assessing how well things went, so it can be a debrief tool to pull out the learning and inform how to ensure continual improvement as well. Although it’s called the National model, I found it’s pretty much used mainly by policing. But there is no reason why that needs to be the case – a common approach could mean better joint decision making. I looked into interoperability – how police and fire and ambulance work together and found these arrangements tended to stop at blue light services (usually in more major incidents, such as JESIP scenarious). I considered how much policing though had interaction with hospitals and social care, in mental health and child protection for example. So, the extended use of the NDM into more day to day use I could see could make a lot of difference. This could also help us with working practices and rationale for the new HMICRS inspection of capability of policing particularly in relation to vulnerability. 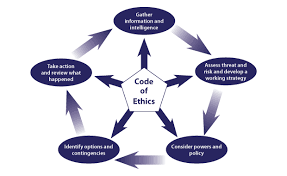 I look also at evidence based policing and saw a fit with the NDM, particularly at the first stage when you examine what you already know and later on when you consider your options. Taking an evidence based approach, rather than just relying on a hunch, or what you did yesterday, or what the boss says – simply because ‘they’re the boss’ – means you can get the best information for the best decision possible in the circumstances. I also read about Bayesian theory, which sounds posh, but is simply a working idea from an English mathematician called Thomas Bayes about how to proceed when you’ve not got the full facts available (have we ever?!) based on situational judgement and probabilities. There’s a great book about Bayes called The Theory That Would Not Die, explaining how the theory was used to help crack the Enigma code during World War 2, when all other approaches had failed. Honestly, if you’re reading this thinking I’m some sort of geek you could not be more wrong! I’m an operational cop through and through who has simply had a look at what’s on offer from a research approach through my Fellowship. My research is now at the stage of working with partners to field test the difference the use makes. I will come back with more updates as this process develops. But in the meantime if you are also interested in this approach please get in touch with me as we can extend the piloting, at a section, BCU or force level. EMPAC congratulates Chris on his work so far and encourages you to help him grow and expand his research reach and impact. In addition, EMPAC is working with Criminology Professor Ken Pease (UCL) and Occupational Psychologist Dr Almuth McDowall (Birkbeck College, University of London) on the Bayesian science behind operational decision making. Stand by for an alternative – operationally friendly – way of thinking about ‘evidence based policing’, based around dynamic decision making, coming soon!